Coolmore and Aidan O'Brien had a relatively quiet week by their high standards, but they finally landed a big one at Royal Ascot when Merchant Navy, a 4/1 shot, held on by a short head from City Light in the Diamond Jubilee Stakes. The four-year-old colt, a leading sprinter with Ciaron Maher in Australia, was Coolmore's big-money purchase in the spring and was having only his second start since arriving in Ireland. The race ended before it began for 5/2 favourite Harry Angel when he got wound up in the stalls and, having appeared to get a hind leg stuck on the back gate, walked out of the gates in last. "He went mad in the stalls - it happened very quick," said his bitterly disappointed jockey Adam Kirby. Trainer Clive Cox said: "He's got quite a nasty puncture wound on a hind leg. He started the race on three legs like a dog with his leg up. Adam couldn't have known." O'Brien, who was celebrating a ninth leading trainer prize - this time on countback from John Gosden and Michael Stoute - said: "We thought it was kind of an impossible task for him as he was so wrong at the weights. He was 12lbs wrong. Really I came here prepared that he couldn't win. I can't tell you how happy we are. "He is relaxed, genuine, a good mover and has a good mind. He is very docile. He has no problem in any way. He is really a joy to do anything with. We don't do a lot with him at home. He is booked to go back home (to stud in Australia's spring) but wouldn't it be great to go for July Cup?" 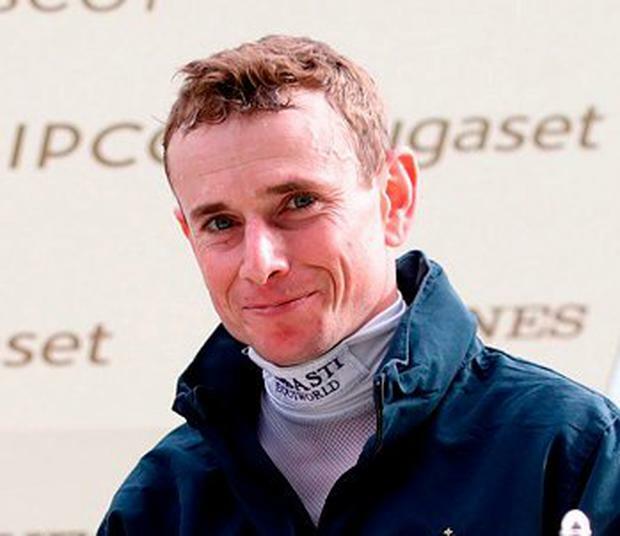 It was Ryan Moore's fifth winner, making Moore top jockey of the meeting for the eighth time in nine years. On the domestic scene, Plinth heads a field of 12 runners for the €25,000 Midlands National Ladies Day July 20th Handicap Hurdle at Kilbeggan this evening. The JP McManus-owned eight-year-old has won a total of 10 races for Aidan and Joseph O'Brien combined, nine of those victories coming over jumps. He has Grade Two and Grade Three triumphs to his name, as well as a course and distance success, but he has plenty to prove following a disappointing run of form. O'Brien also saddles course winner Treasure Chest, while Willie Mullins runs both Bargy Lady and Lareena. Tony Martin's Pyromaniac and Flaviana from Jessica Harrington's yard are other interesting contenders for the valuable prize. There is also a total prize fund of €25,000 up for grabs in the Follow Kilbeggan Races On Twitter Handicap Chase. Course and distance winner Conrad Hastings tops the weights and while he has been pulled up on his last two starts at Cheltenham and Punchestown, he has less on his plate for his latest assignment. Teacher's Pet should go well after finishing second in a good mares' chase at Limerick, while Cecil Corbett is sent into battle by Gordon Elliott little over a week after scoring at Downpatrick. Daragh Ó Conchúir A lot of people like listening to Ted Walsh because of his impatience for pandering. For me, though, it is the light dancing in his eyes and the energy that fills him with animation when he is reminiscing about the horses and riders of yore that brings the greatest joy.